Create a new showcase for three potted plants using the Achla Black Wrought Iron Stands. These durable, open frames are perfect for elevating your existing planter, and the set of three is great for creating a wonderful grouping. A 9.5" diameter, wrought iron ring forms the base of each stand, supported by three scrolled feet. This ring can easily accommodate an 8.625" diameter pot, elevating it 4.75" off of the ground for fantastic drainage and air circulation. The black, powder coated finish on each ensures both beauty and durability, while the inwardly-scrolled legs lend a hint of movement. For even more versatility, place a 10" to 12" gazing globe in one stand, or use one to support your existing bird bath. 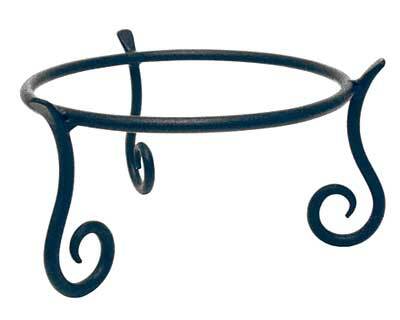 Help your favorite potted plants remain lovely and robust by placing them in these Black Wrought Iron Stands. Note: This case pack includes 3 of the Achla Wrought Iron Stands, Black, 9.5" diameter.